Navigational intent – Searchers seek a specific company or website. They don’t necessarily want to buy any of their products. They want help navigating to the site. Example: Uncertain of my local bookstore URL, I search the name of the store and visit the site to find out the store hours. Investigational intent – Searches with investigational intent hover between being informational and transactional in nature. People seek information to research future purchases and services they may want to buy, or companies they may want to buy from some day. Example: I need a new pair of running shoes and want the best deal. I search types and brands to comparison shop and find the highest quality pair for the lowest price. Transactional intent – Searchers are ready to buy. They search with keywords that are long-tail, specific, and intentional. Example: I know the brand, color, and size of running shoes I need. I want to buy them and have them arrive by next week. 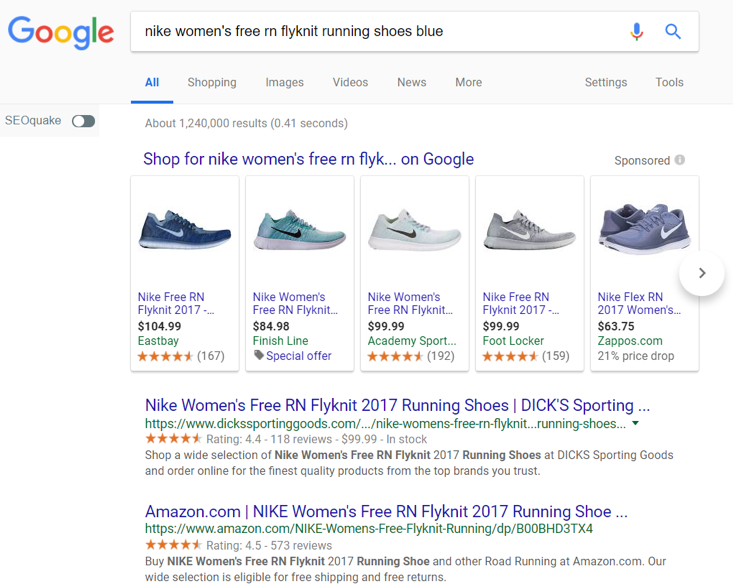 I search for “Nike women’s Free RN Flyknit running shoes blue size 8” and find the best price and delivery time – and purchase the shoes. Target the keywords that hone in on the users’ search intent based on the action you want them to take. For example, if your goal is email list conversions, you might focus on informational intent searchers because they may discover you as a trusted source in your topic area. You might target keywords that begin with “how to” and ones that ask questions. Bottom line: Help your content perform better and make sure you target the right keywords and search intent to achieve your goals. High-performing content starts with a high-powered, irresistible headline that makes people want to read more. You may have read about formulas and tools to help you craft headlines proven to perform better. But what about your headline’s usefulness factor? Does your headline accurately describe the content piece and let readers know what they’re in for if they keep reading? Or does your headline use sneaky hyperbole and clickbait tactics to mislead readers? Does your headline set up realistic expectations for the content? Or does it ultimately let your audience down? Your content should build trust with the reader, but you can’t do that if you start with a headline that stretches the truth or neglects important information. Is this jaw-dropping? No. Is the headline extremely misleading? Yes. 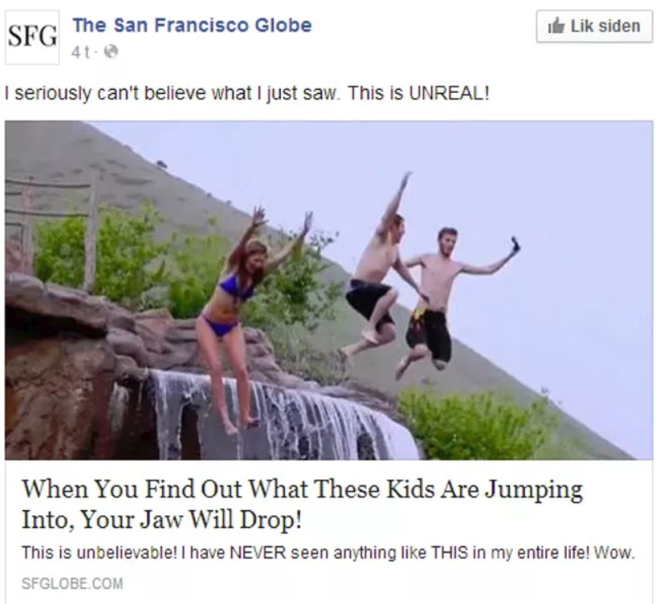 The article reveals the kids are jumping into a swimming pool. Here’s the interesting thing. Clickbait headlines don’t perform well. (Maybe this means people are catching on to the sneaky ways.) 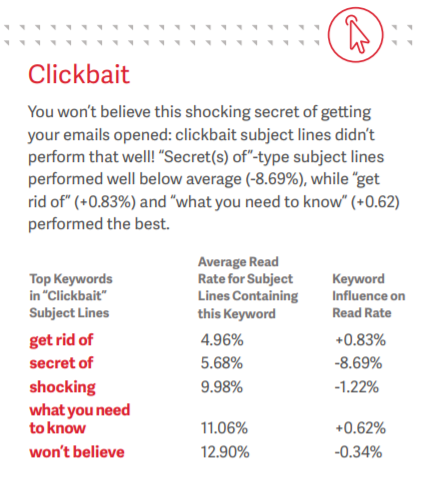 In a 2015 study, ReturnPath analyzed over 9 million headlines and subject lines and found that ones with common clickbait words performed below average as opposed to headlines focused on wording that emphasized benefits or urgency. The average read rate is much higher, spanning from 11% up to almost 33%. 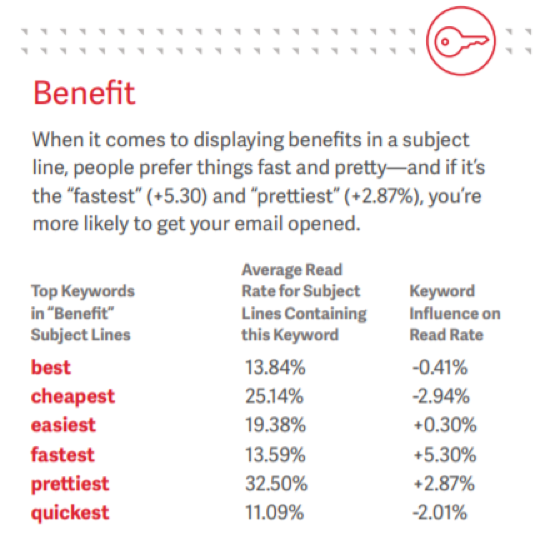 Bottom line: Use powerful wording to create irresistible headlines. Use formulas and tools to help you craft them, but don’t oversell your content or mislead people about the value it provides. Aim to be helpful and enticing for best results. After you hook ’em with your headline, what keeps readers moving through your content piece? It’s a few things, but a big one is how well your writing flows. 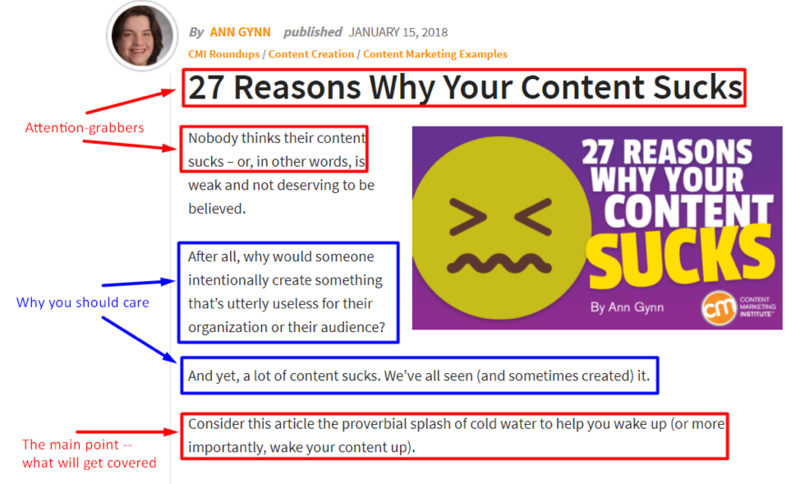 How well do you carry your readers along your content river? How easy is it to follow you from point to point, line to line, and paragraph to paragraph? Avoid these mistakes and aim to improve your flow. Bottom line: Naturally guide your readers through your thought process, points, and information in a logical way – making them much more likely to complete a desirable action after they finish. The power of images in your content should be blatantly obvious, given that we’re a visually oriented society. 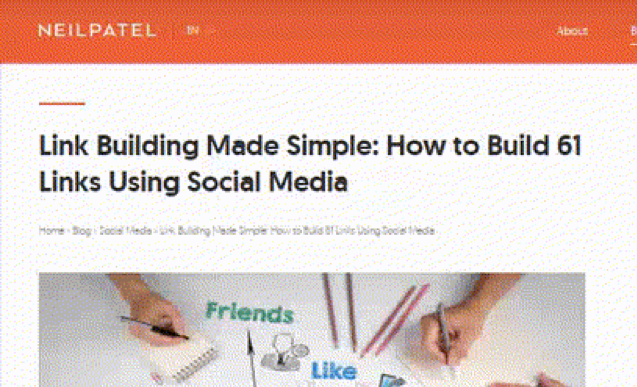 BuzzSumo analyzed over 1 million articles to see how many with images were shared. Then it looked at the top shared ones to find telling trends. Turns out, articles with images peppered in every 75 to 100 words got twice as many shares as articles with fewer images. Include images throughout the body of your content that relate to and expand on the text. If you need inspiration, look at Neil Patel. He consistently creates content with examples, images, screenshots, and graphics to illustrate his points. Bottom line: Provide relevant images that add context and illustrate your points. This not only makes your content more interesting, but also increases the chances that your readers will remember it. 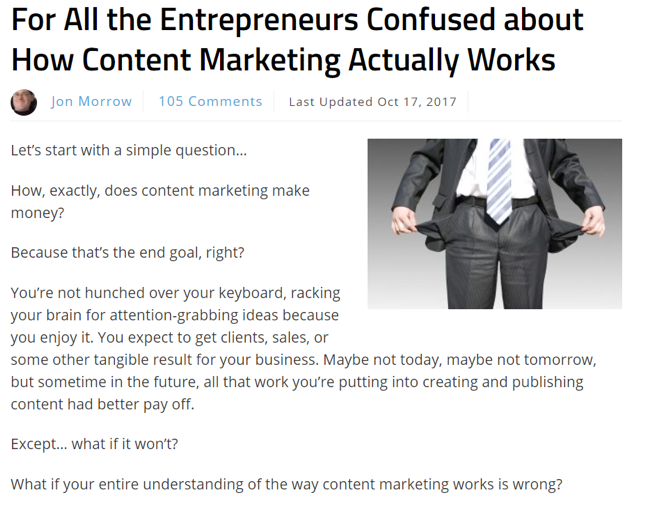 If your readers can’t figure out why they should care within the first paragraph or two, they won’t. They’ll bounce from the page. If you waste time with an introduction full of fluff, your reader will click away to find another piece of content that gets to the point. After you get their attention, tell them the topic, why they should care, and the main point you’re proving or explaining in the content. Remember, this isn’t high school composition. Throw the rules you learned there out the window and focus on writing to capture the attention of the average internet user. Bottom line: Here’s a great example of an intro that works. It effectively grabs your attention and shows the value of the post immediately. Follow its lead and you’ll improve your content’s read rate as well as the length of time your reader stays on the page. Both add up to a better chance of converting. High-performing online content ultimately inspires action. Of course, you can’t get readers to act unless you give them an opportunity. It should come in the form of a call to action – a link in your content that directs readers on what to do after they’re done reading. They are tied into the content. Clicking the CTA should feel like a natural progression. They use strong, persuasive wording (think powerful action verbs) that make readers want to click. They are enticing –a graphic, a button, or linked action words in the CTA sentence. This CTA is related to the content, uses strong verbs (e.g., “download,” “learn”) and is enticing to click because it’s larger than the surrounding text, bolded, and in a color. 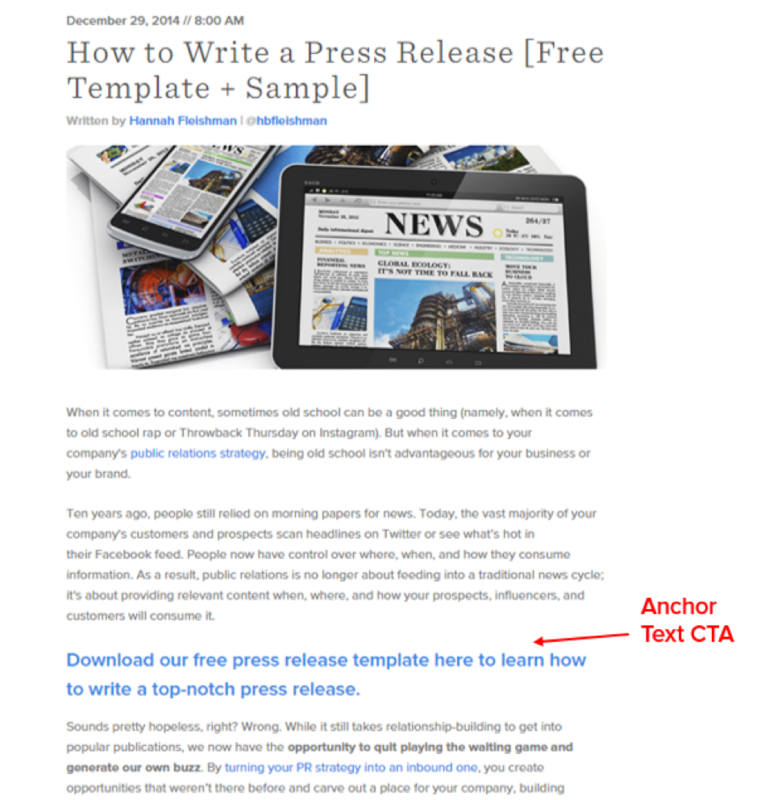 According to a HubSpot study, this anchor text CTA (a single line of text linked in the content) rakes in 47 to 93% of leads from posts where it appears. And, it works better when it shows up at various points in the content, not just at the end. 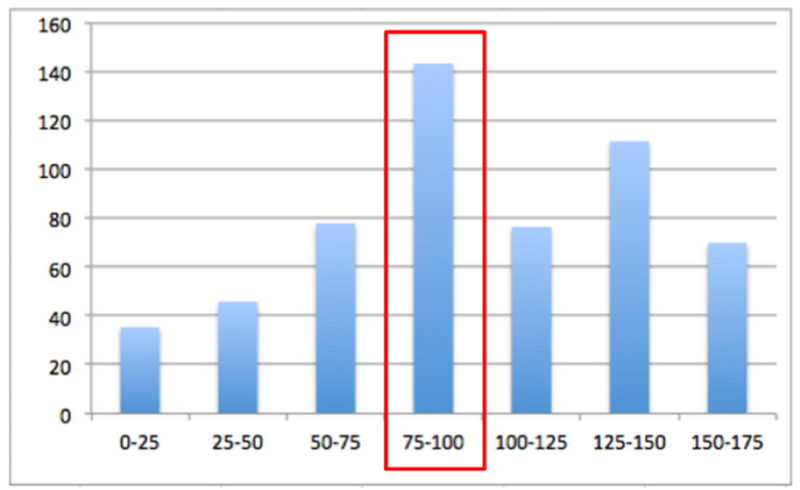 Bottom line: As you can see, a compelling, clickable CTA does a lot of work for a high-performing content piece. It’s the final push to get your readers to take that desirable action, so you need to make sure it counts. High-performing content doesn’t have one or two standout factors. Instead, it has many pieces that each contribute to its success – shares, conversions, sign-ups, or some other desirable reader action. Think of it this way: A piece with a fantastic headline is nothing without a solid intro and value-added content. The first part grabs readers, the second keeps them on the page, and the third nurtures them, warming them up for the irresistible CTA. You need each piece to inspire action and get results. Once you have all of them in place, your content should perform better than you ever dreamed. Crafting content is both an art and a science. Learn more about each side of the practice at Content Marketing World Sept. 4-7. Register today using code BLOG100 to save $100.